Durham Region Real Estate Serving Oshawa, Whitby, Ajax, Pickering and Clarington. Welcome to DurhamHomeSavvy.com a top-ranked real estate and MLS® property search of Durham Region and the cities, townships and municipalities of Ajax, Brock, Clarington, Oshawa, Pickering, Scugog, Uxbridge, and Whitby. You are interested in properties listed and located in the Durham Region. You enjoy researching or looking at houses, condos, townhomes, bungalows, apartments, vacant land, investment properties, duplexes, or any other form of real estate. 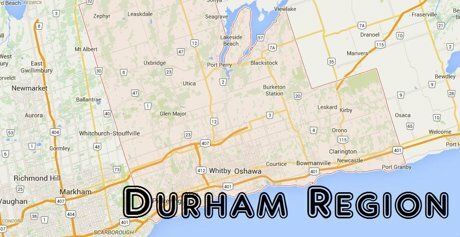 The Regional Municipality of Durham was established in 1974 and became one of four regional governments in the greater Toronto area. Durham Region consists of the following eight municipalities: Ajax, Brock, Clarington, Oshawa, Pickering, Scugog, Uxbridge, and Whitby. Durham Region lies just east of Toronto in southern Ontario known as the Golden Horseshoe. The southern portion of Durham is greatly urban and recently is experiencing rapid growth in all three sectors of residential, industrial and commercial. Northern Durham is mostly rural and enjoys a thriving agricultural sector. Northern Durham lies within the Ontario-designated Greenbelt and contains the environmentally sensitive Oak Ridges Moraine. Durham Region, along with much of the Greater Toronto area has held steady, aggressive growth in 2016 with prices in Durham averaging 14.1% more since the end of 2015, where the average Durham Region home sold for $442,082 (includes MLS® statistical data through 5/31/2016).